Brighten up your child’s face, arms, legs, or any other part of their body with these fun 1000 Books Before Kindergarten temporary tattoos. 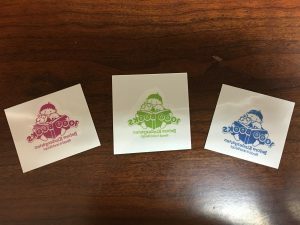 The tattoos come in green, pink, and blue. The tattoos measure 1 1/2″ x 1 1/2″ and are made with safe, lead-free ink and paper approved by the FDA. All proceeds benefit the 1000 Books Foundation, a 501(c)(3) nonprofit public charity. Order directly from the 1000 Books Foundation using the link below and receive free shipping and handling for a limited time. A packet of 21 tattoos is just $2.99.